The current craze for cupcakes is something that shows no sign of ending any time soon. I’ve talked before of my cynicism about the all-too commonplace bland and boring sponge, topped with inches of teeth-itchingly sweet icing and rammed full of unknown ingredients in the form of artificial colours, sparkly sprinkles and other decoration. To say I never bake cupcakes would be a lie. I know how much people love them and sometimes only an individual cake will do. But mostly I try to make them a little more interesting, something like these sticky toffee sponge cakes filled with dates and caramel sauce or raspberry cupcakes baked in muffin cases and topped with ganache in place of pillows of buttercream. I’ve had my eye on some David Lebovitz cupcakes for a while for exactly this reason. The picture in his book, Ready for Dessert, shows them as small, sticky and dark brown in colour, topped with just the smallest swirl of icing and suggesting flavour over fancy appearance. With ingredients like Guinness, stem ginger, cinnamon and cloves, how could they be anything but full of flavour? As with almost all the recipes I read and bookmark, I got slightly distracted. A couple of weeks ago Emma posted this incredible looking cinnamon ice cream with sautéed apples and cider caramel which shouted ‘Autumn’ at me so loudly I knew I’d have to try some variation of the combination as soon as the colder weather set in. 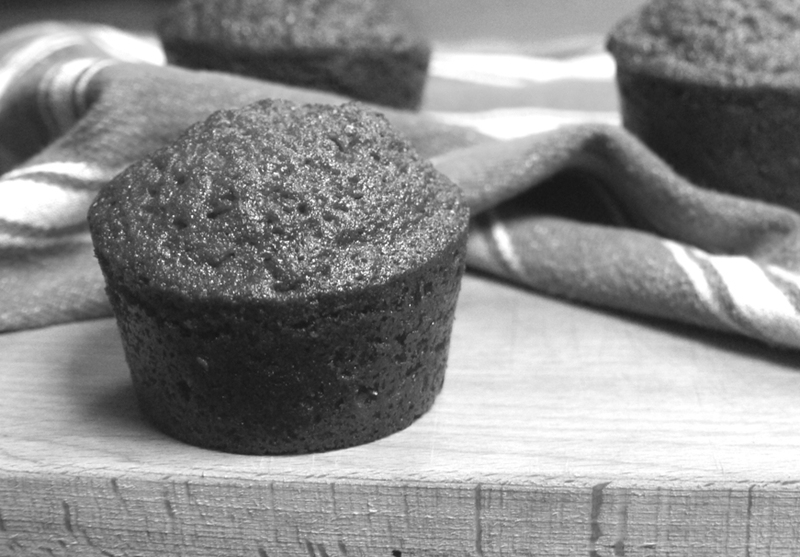 Reading Lebovitz’s recipe I saw that, if baking his Guinness cupcakes for kids, you could substitute cider. I’m guessing this is more a flavour thing than anything to do with the alcohol (I can’t imagine he goes round offering cider to children on a regular basis!) but either way, they seemed like the perfect vehicle through which to try out this cider-caramel combination. Rather than frost the cupcakes, I decided to serve them as dessert, baking them direct into a silicone muffin pan so that their edges were defined. I also added some chopped pecans for texture, then served them with cinnamon ice cream (adapted to use honey instead of sugar for autumnal comfort) and a hot, molten puddle of caramel sauce, rich with butter, sugar, golden syrup, a slick of cream and a sprinkle of sea salt. 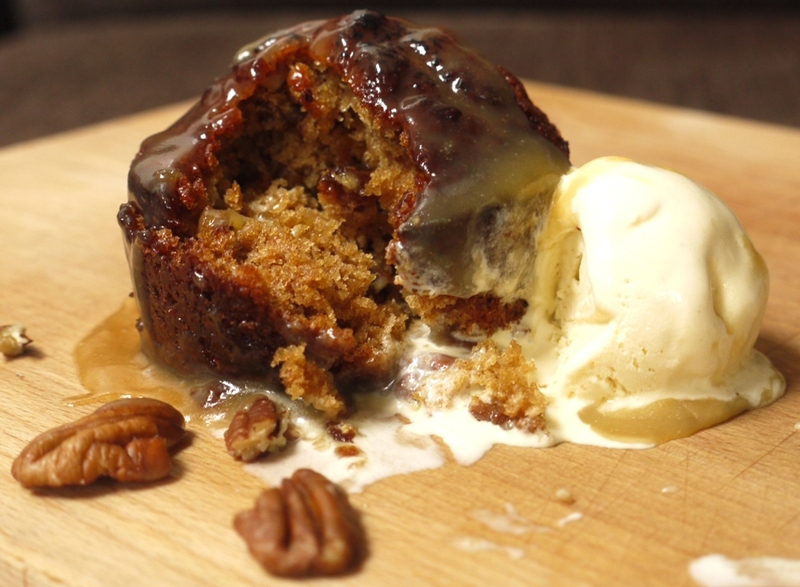 A quicker, slightly less sticky but equally delicious toffee pudding, in cupcake form. The combination of cider, spice and caramel is perfect, warming and comforting you from the inside out. As these cupcakes were baking the house smelt like Autumn itself, the rich aromas of ginger and cinnamon wafting above deeper notes of butter and sugar. 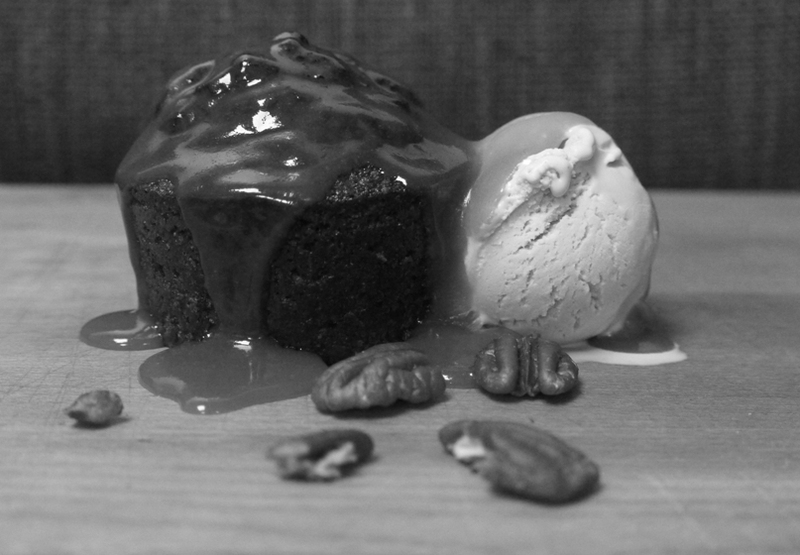 Served with cinnamon ice cream they take on a new dimension – crunchy pecans, sticky cake, cool ice cream and hot, unctuous sauce. If you can’t quite bear to tear yourself away from a more traditional cupcake, these would be delicious soaked in a little syrup and topped with cream cheese frosting, lifted with a little lime juice or crystallized ginger. But seeing as it’s such horrible weather in the UK right now, why not curl up inside, shut out the cold and celebrate your cupcakes by turning them into a classic British pud, complete with warmth, ice cream and lashings of sweet, salty sauce? Preheat the oven to 180 degrees C. If not using a non stick silicone mould, lightly grease a 12 hole muffin tin. In a large saucepan, bring the cider, golden syrup and vegetable oil to the boil. Remove from the heat immediately and whisk in the bicarbonate of soda. The mixture will froth up then settle down. Stir in the brown sugar then set aside to cool slightly. In a small bowl, sift together the flour, baking powder, spices and salt. Whisk the eggs into the tepid cider mixture, then whisk in the flour until just incorporated, taking care not to overmix. Gently stir in the chopped pecans. 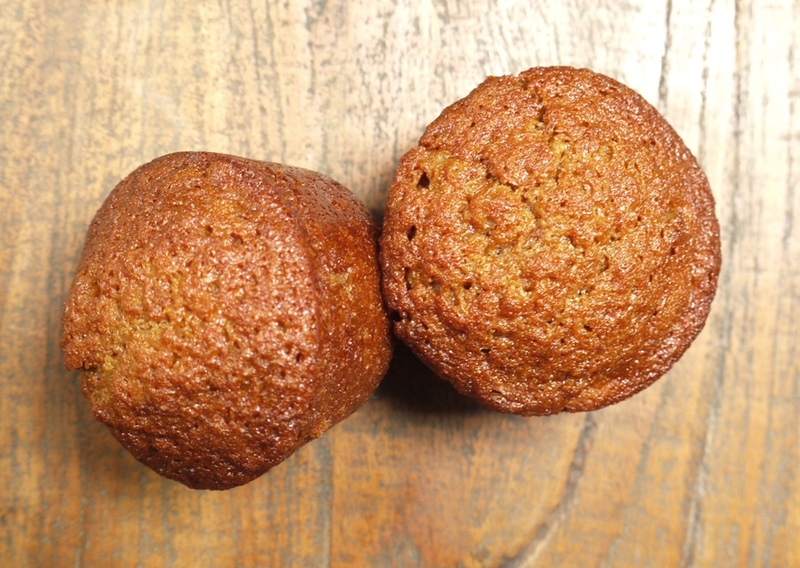 Divide the batter between your muffin cases and bake until the cupcakes feel just set in the centre – about 22 minutes. Remove from the oven and allow to cool completely. Melt the butter, sugar and golden syrup over a medium heat until all the sugar is dissolved. Stir in the cream, continue to heat for about 30 seconds more then remove from the heat and stir in the sea salt. Store in a jug in the fridge until ready to use or for up to one week. Warm the milk, 175 ml of the cream, broken cinnamon sticks and salt in a medium saucepan. Just before it starts to bubble, remove from the heat and allow to steep for one hour. Pour the remaining 200ml of cream and honey into a large bowl and set over an ice bath. In a separate medium bowl, whisk the egg yolks until pale and fluffy then set a sieve over the top. Reheat the milk mixture then slowly pour the warm milk through the sieve (to strain out the cinnamon sticks) into the egg yolks, mixing constantly. Scrape the warmed egg yolk mixture back into your saucepan. Stir the mixture constantly over a medium heat using a flat wooden spatula until it thickens and coats the back of the spatula. Remove from the heat and pour into the cream and honey mixture. Whisk over the ice bath until cool. Chill the mixture in the fridge overnight then churn according to your manufacturer’s instructions. Remove the ice cream from the freezer and allow to soften in the fridge for ten minutes. Warm the caramel sauce in a small pan over a gentle heat. Place one cupcake in a serving bowl, scoop on a large dollop of ice cream then smother with hot caramel sauce. Serve. 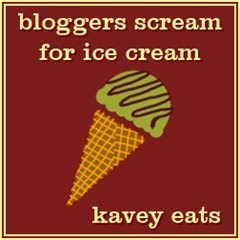 I’m entering the cinnamon ice cream from this recipe into Kavey’s Bloggers Scream for Ice Cream September challenge: Spices. Click the link to find out more about this great monthly challenge and to join in! Wonderful food writing and fantastic recipe. I shall be doing this and photographing it – excellent idea. This is such a lovely flavour combination and definitely a much better way to eat cupcakes than topped with a mount of buttercream. I love that first picture too! Ooh what a lovely idea! I’m fascinated as to how the honey changes the ice cream – can you taste it? Do you still get the very nuanced cinnamon flavour? These look so beautiful and the flavour combinations are simply autumn in cake form! These look SO GOOD. Exactly my kind of baking and full of stuff I love! I’ve really enjoyed all your recent posts but realise I have been rubbish at commenting because it’s not very easy to comment on blogs from an iPhone, and I’ve been travelling for a month so that’s all I had! These however are possibly my favourite. Definitely a step up from a cupcake – it’s interesting that they use vegetable oil rather than butter, though, as that’s normally something I associate with muffins. Anyway, they look incredible! Just stunning. The whole things looks delish. this looks amazing! I love the salted caramel and ice cream instead of icing! this is my kind of a cake! You write so invitingly, I don’t think it would matter what the actual finished product was, I would want to eat it. As it happens, I would want to eat one of these come what may. Nuts, cider, cinnamon and caramel all combined into one luscious dessert is just too sublime to miss. Food, Photography & France – enjoy! I’d love to see one of your photos when you do make it. Kathryn – it took a lot of willpower to take that photo before diving in! Emma – you still get a lovely cinnamon flavour, although the honey is quite strong. Really really liked this one. Elly – ahh, thank you. So pleased to hear you’ve been enjoying the posts. The Melbourne Food Snob – I’d never baked with cider before either, it’s a lovely and slightly unusual ingredient. The Hungry Mum – thank you. Baked by Iris – it is! Choclette – aw, you’re too kind. Gorgeous! I can just tell that would be amazing to plunge into my mouth – satisfyingly moist, I’d imagine! These are filled with some of my very favorite flavors, the honey, caramel and the cinnamon….love it! ohh.. I just fell in love. My goodness… these look spectacular! 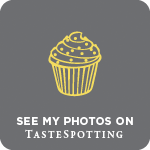 Silver Screenings – I think it’s such a shame that people are so obsessed with cupcakes. There is so much more in the world of baked goods! Dana – thanks so much for your lovely comment. Hope you’ll be back soon! Amy – you’re right, I’m slightly obsessed with my mini moulds and individual tart tins at the moment! Turntable Kitchen – they don’t take long to make, get a batch in the oven now! Jaime – haha, love this comment! Sylvie – I’m more of a summer person, but I do love the flavours of autumn. 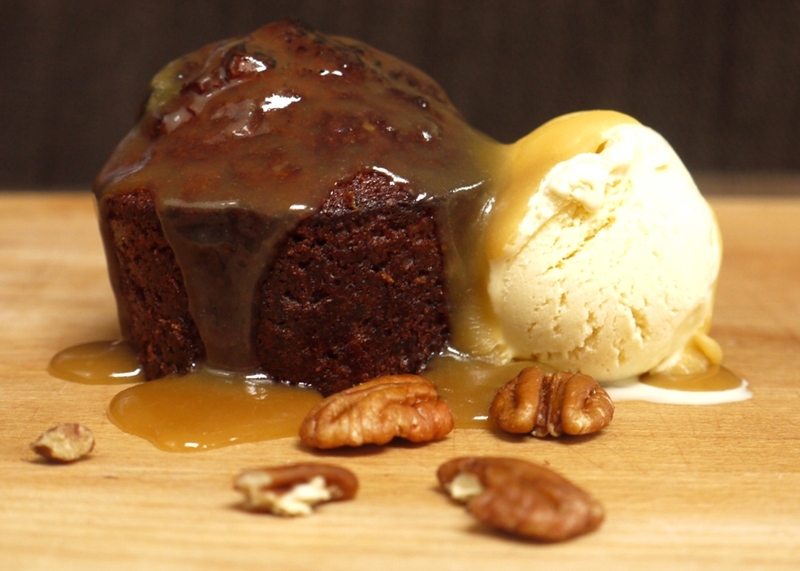 Lianne – it’s super comforting, but lighter than sticky toffee pudding!